Coca Cola Içecek (CCI) presented itself as a company operating as producer under license in 10 countries east and south of Turkey. CCI is bottling their sodas in one of the dryest regions in the world, so the focus on water is evident. The economic positions of areas served differ enormously, however the markets have thing one common: more than half of the population is under 30. CCI was in 2008 the first Turkish company to produce a CSR Report at the C Application Level. Four years later it produces an A+ report that is GRI checked. That proves me that CCI is determent to be a leader in CSR Reporting. Unfortunately G4 stops using the application levels, now that CCI has achieved the highest sport on the ladder. Obviously I asked him, what problems he would face, explaining his board that the road to A+ has ended with G4. Atilla Yerlikaya responded: “Yes G4 and especially that loss of the application level will be a novelty I need to digest. And, yes it will be difficult to tell this my boss. However difficulties lead to new opportunities.” Smart and optimistic fellow! Most impressive to my opinion, is the vision of ICC towards dilemmas. Yerlikaya: “You can not hide your dilemmas for ever, so get to understand them and share them with your audience.” That is fresh management. However, I did not find a single dilemma in the CSR Report. That is a bit disappointing. “At CCI, we believe that parents should make decisions about the eating habits of their children. We therefore do not engage in advertising or marketing activities targeting children under 12 years old. Akçansa is a giant company within the Heidelberg Cement Group that produces concrete in quantities unknown to The Netherlands. This is an industry known for its huge demand for both resources and energy. 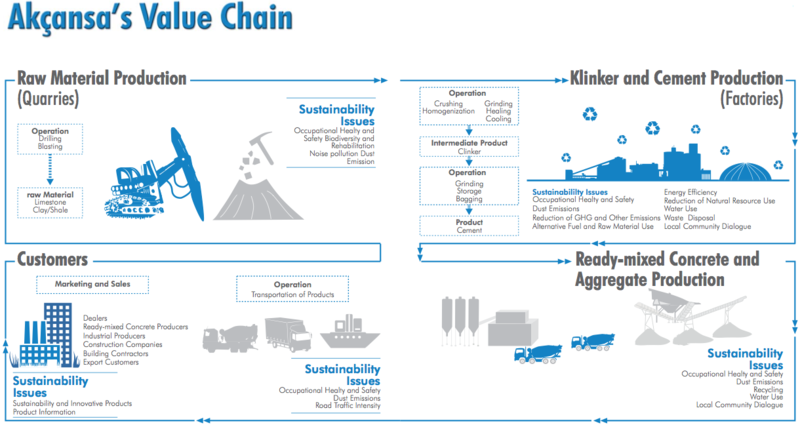 In a graphic they show their impacts on the value-chain. General manager Hakan Gürdal explained to us, that his introduction with CSR totally changed the way he manages his company. Traditionally he was only occupied with steering on short-term money related issues. The report they produce gives him now a direction for ten years. He said: Our report is a promise to society on our behaviour. To my opinion, what he said even goes beyond: The report as a contract with society. Introducing incentives to truck-drivers to reduce speed. I think that the money saved with help of these smart economies was an enabler to get more attention and acceptation to CSR. To my surprise Akçansa wants to export its knowledge to their competitors. Instead of safe-guarding their competitive advantage, the company is willing to share its best practices. That is true leadership. Taking this all into account, both Coca Cola Içecek and Akçansa are true sustainability leaders. Also in the Dutch context. Thanks for your views and analyzing the reports of Akcansa & CCI. Independent feedback is of great value to reporting companies and overall sustainability efforts.